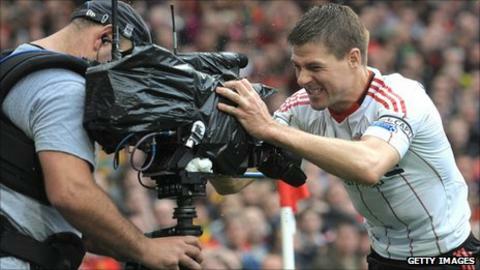 Premier League clubs should be able to do their own television deals abroad, Liverpool's managing director has said. Ian Ayre fears English sides will be left behind by their European rivals if overseas revenues continue to be shared equally between the league's 20 clubs. Ayre said: "The other European clubs just don't follow that model. They will create much greater revenue to go and buy the best players." The Premier League's foreign rights deal, worth £1.4bn, expires in 2013. Under current rules, 14 teams would need to vote in favour of any new arrangements. Ayre believes that Liverpool - along with Manchester United, Chelsea and Arsenal - deserve to receive an increased share. In Spain, Barcelona and Real Madrid are able to negotiate their own deals, meaning that they are able to generate far more revenue than their smaller La Liga rivals. And Ayre warns of the long-term consequences: "If we carry on sharing that international revenue equally, you are disadvantaging us." The vexed issue of overseas rights is something of an old chestnut for the Premier League's chief executive Richard Scudamore to handle. Every so often when the so-called big clubs fear they may be falling behind their European rivals, there is a flurry of activity. Whatever their probably legitimate argument that overseas viewers want to watch them, not the "Boltons" of this world, they run up against the same issue. Making major changes to policy requires 14 of the 20 clubs to vote in favour, a fact which tends to flatten out self-interest for the common good. If collective selling has enriched all the members way beyond the expectations of the old Division One days, why rock one of the league's founding principles now? He told BBC Radio Merseyside: "It is a debate that needs to be had on a more collaborative basis between the clubs of the Premier League. "I am certain that if you are a Liverpool fan living in Liverpool, you subscribe to Sky because you support Liverpool, and if you are a Blackburn fan you subscribe to watch Blackburn. "So it's probably right and proper that the money in this country is shared the way that it is. "But if you go further afield then it is a myth that the Premier League is huge. "It is popular but the clubs that are really popular are the clubs like Liverpool, Manchester United and Arsenal. "We saw that in Malaysia in the summer. We were 5,000 miles from home and we had 80,000 fans watching us play and 40,000 turning up to watch a training session." And he said that if foreign revenues continue to be shared equally, the bigger clubs in countries like Spain will leave English clubs behind. "They will create much greater revenue to go and buy the best players. "While we must be careful to maintain the integrity of the Premier League we have to maintain our position in Europe as well." Geoff Mesher, a football finance expert from Grant Thornton accountants, told 5 Live Ayre's proposal could damage the competitiveness of the Premier League. He said: "Barcelona and Real Madrid sell their own TV rights domestically and overseas. They earn 12 times as much as the lower clubs in La Liga. I don't think it is entertaining to watch Spanish football where Barcelona and Real Madrid are the only two clubs who can win the league. "I think there would be a real risk of upsetting the competitive balance we have in England and the Premier League and that would do two things: drive further wage inflation and may erode the brand of the Premier League which in the long run might affect the income for the top clubs." Last month Manchester United boss Sir Alex Ferguson called for more revenue from the overseas broadcasting deal, but he was in favour of the status quo in terms of how the money is split. Ferguson told BBC Sport: "We are being shown in 212 countries at the moment so whatever we are being paid, it is not enough. "There is a negotiation to be had there next time around. [Individual rights] is the big issue in Spain at the moment but I've no great feelings about that. "We'd love to have our own but I don't think it should happen that way. It's quite fair to have all equal shares."